Interval regression is used to model outcomes that have interval censoring. In other words, you know the ordered category into which each observation falls, but you do not know the exact value of the observation. Interval regression is a generalization of censored regression. Select the category that best represents your overall GPA. Again, we have a situation with both interval censoring and left- and right-censoring. We do not know the exact value of GPA for each student; we only know the interval in which their GPA falls. This is a slight variation of Example 2. In this example, there is only interval censoring. We have a hypothetical data file, intregex, with 30 observations. The GPA score is represented by two values, the lower interval score (lgpa) and the upper interval score (ugpa). The writing test scores, the teacher rating and the type of program (a nominal variable which has three levels) are write, rating and type, respectively. Note that there are two GPA responses for each observation, lgpa for the lower end of the interval and ugpa for the upper end. Graphing these data can be rather tricky. 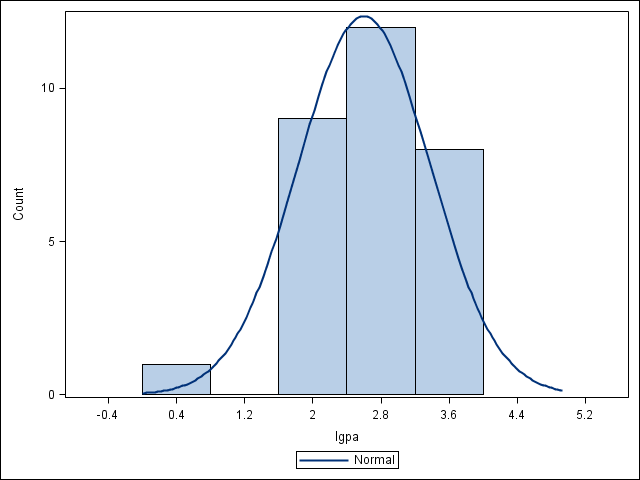 So just to get an idea of what the distribution of GPA is, we will do separate histograms for lgpa and ugpa. We will also correlate the variables in the dataset. Interval regression – This method is appropriate when you know into what interval each observation of the outcome variable falls, but you do not know the exact value of the observation. Ordered probit – It is possible to conceptualize this model as an ordered logistic regression with six ordered categories: 0 (0.0-2.0), 1 (2.0-2.5), 2 (2.5-3.0), 3 (3.0-3.4), 4 (3.4-3.8), and 5 (3.8-4.0). Ordinal logistic regression – The results would be very similar in terms of which predictors are significant; however, the predicted values would be in terms of probabilities of membership in each of the categories. It would be necessary that the data meet the proportional odds assumption which, in fact, these data do not meet when converted into ordinal categories. OLS regression – You could analyze these data using OLS regression on the midpoints of the intervals. However, that analysis would not reflect our uncertainty concerning the nature of the exact values within each interval, nor would it deal adequately with the left- and right-censoring issues in the tails. We will use proc lifereg to run the interval regression analysis. We list the variable type on the class statement. We enclose both lgpa and ugpa in parentheses on the model statement before the equals sign to indicate that these variables are the outcome variables. We list write, rating and type as the predictor variables. We use the d=normal option to specify the distribution as normal. The model information is given first. Among other things, it includes a listing of the outcome variables, the number of cases in the dataset, the type of distribution used, the log likelihood, and the number of cases read and used in the analysis. Information on the variable listed on the class statement is listed next. This indicates that the variable type has three levels. The Model Fit Summary table gives information about the model, including the -2 log likelihood, the AIC and BIC values. These values can be used to compare models. In the table called Type III Analysis of Effects, we see the degrees of freedom, Wald chi-square and p-values for the variables in the equation. The variable write is statistically significant, the variable rating is not, and the two degree of freedom test of the variable type is statistically significant at the .05 level. The ancillary statistic Scale is equivalent to the standard error of estimate in OLS regression. 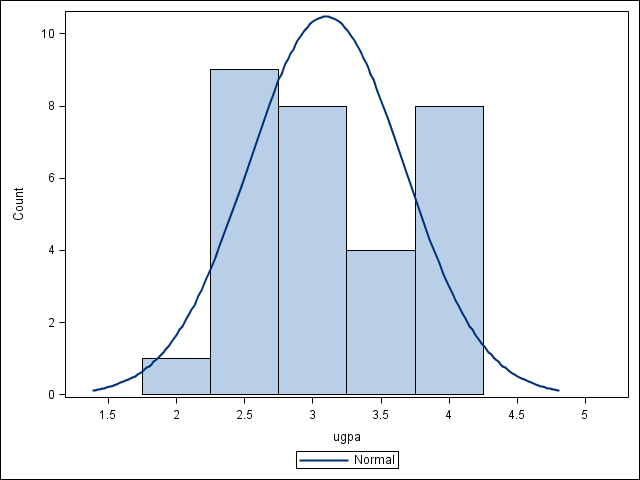 The value of 0.29 can be compared to the standard deviations for lgpa and ugpa, which are 0.78 and 0.57, respectively. This shows a substantial reduction. The output also contains an estimate of the standard error of sigma, as well as a 95% confidence interval. The lifereg procedure does not compute an R2 or pseudo-R2. You can compute a rough-and-ready measure of fit by calculating the R2 between the predicted and observed values. Long, J. S. and Freese, J. 2006. Regression Models for Categorical and Limited Dependent Variables Using Stata, Second Edition. College Station, TX: Stata Press. Stewart, M. B. 1983. On least squares estimation when the dependent variable is grouped. Review of Economic Studies 50: 737-753.